Alas, what are we to do! Neither of these “standard” formats work, because the dates are not in the correct format for the Query function. Per the Query Language documentation, we need to include the date keyword and ensure that the date is in the format yyyy-mm-dd to use a date as a filter in the WHERE clause of our Query function. Putting aside the Query function for a moment, let’s consider that "select..." string. Our challenge is to create a text formula to create this syntax for us, inside our query function. ="select C, B where B > date '"&TEXT(DATEVALUE("1/1/2000"),"yyyy-mm-dd")&"'"
That’s the syntax challenge done! We can now plop that string into the middle argument of our Query function as per usual, and it’ll do the trick for us. 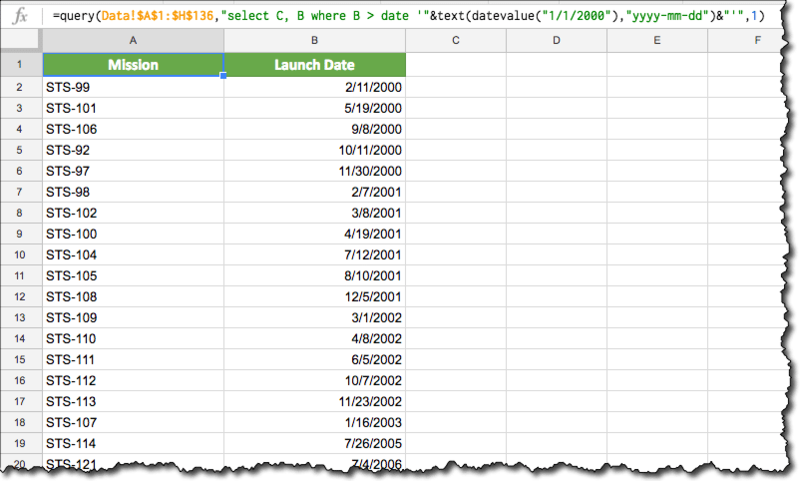 In this case, I was using a table of Space Shuttle mission data from Wikipedia, which contains a column of launch dates. I used the IMPORTHTML() function to import that table into my Google Sheet, into a tab called Data in the range A1:H136. There’s a link to this dataset and worksheet at the end of the post. Is there an analogous method of summing durations (hh:nn) in queries? For me, sometimes the work when the original data is in hh:nn format. Sometimes I have to change them to a serial number for the query to work. I have no words to thank you for your wonderful examples. Please, can you help me? Thank you. If the datatype in cell D1 (number) matches the datatypes in column J (e.g. numbers as well) then it should work for you. Hey Ben, you are amazing! This year I have been creating a monthly summary of posts and updates associated with all things GSuite. It occurred to me after nine months that I should really be storing all the links in some sort of database. My question is how to automate the process of turning that into a monthly post (https://readwriterespond.com/2017/10/scripting-automated-solution/). I made two changes: 1) put quotation marks around your start and end dates in the TEXT formulas; and 2) you had B instead of C in your last date comparison. I think this query formula now works as you intended. But I got into another one… For some reason, it works fine when I have ” when Q > date ‘”&Text(F17, “yyyy-mm-dd”)&”‘ “, but the query is empty if I change the “>” sign for a “=” sign. How can I filter my query so that it matches a specific date? (in your example, it would be for instance a list of shuttle missions on January 1st. I’ve added both these examples to the end of the linked template Sheet. You’ll also notice that I had to add 1 to the month(), that’s because it’s 0-based. Hola Ben, en month(B) + 1 = 7, existe la forma de hacer referencia a una celda?, por ejemplo una lista donde esten todos los meses? Hie Ben, thanks for expanding the formula. How can i create a formula, where the same date has multiple entries, and i want the last entry of a specific date. I am trying to filter dates from last week and 3 week out from my spreadsheet. I keep putting the date function and still get an error. I was able to transfer by selecting A,B, C etc but now I just want those 4 weeks to show and when I put some new dates in the master spreadsheet I want it to automatically populate the query function spreadsheet. Can you help me with that? I’ve searched far and wide to find a solution for TODAY() and always came up short until today. Thank you! Please help me to get the totals by dates only from Date and time column in a query function. This ensures that the datetime in A2 is between the datetimes in columns B and C.
But it works fine with > operator! Is there a time component to the date in column B? That would be a reason why it doesn’t equal. This is a great article, I have not used Query much before, let alone with dates, so this did help. This has got me half way to what I am trying to do and I was wondering if you could point me in the right direction? I have a sheet listing items I need by date and use. Column A is the date (list the full year), then column F is the amount I need. I would like to look between a date range and just return the MAX number in F of that range only. This should calculate max F inside of your date range. You saved the day!!! Thank you so much for your blog, this is the second time I’ve referenced it. Ran into this issue today and spent 30 mins trying to figure out why I wasn’t getting any results out. Glad I found this article, the solution is really well explained. Long time reader. Love your site. I ran into ONE issue with your “filter between two dates” formula. I am not sure if it was intentional. With your formula, it would equal 4 instead of 5 because it would only count starting from the second 2018-04-01. You have helped me so much, I thought I would return the favor by pointing something out. If this is intentional I would love to know why in case there is some huge flaw in this method. Thank you again for your help. The “>” implies greater than, so it will count everything that is after that date. The “>=” is a greater than or equals to, so will include everything on that date as well. I’m new to Google sheets. Thanks to Your website, it is very useful in my learning. I see there are lots of possibilities comparing dates with QUERY function. But, I’m trying to achieve this with the 2 sheets. I’d like to display the active employees in a for any given month. Is this possible with QUERY function? Could you help me with this? Artigo Excelente. Muito Obrigado por compartilhar seu conhecimento conosco! im working in a google sheet data base that i get from some google forms, im trying to filter the results of my query function by the timestamp of the responses but its not working. this is the query formula i have so far. Hi Ben, I want ask you for advice. I want select some data (temperature) from column, but not by date as you show above, but by time. For example I’m interested in everyday temperature at 5. Could you please help me ? Great Article. I am in need of some help with a workflow that I am creating where that references “today’s date” across multiple sheets and multiple columns where today’s date could be present. See example in the provided link. There are possibilities for today’s date to be in columns K, M, N, O, or Q, which is consistent across four other sheets in this doc. Ultimately what I am trying to create is a daily task filter (which will be its own sheet) where my employee can follow up on sales leads that are in various stages of the sales process according to date. Ben, great article. Is there a way to query multiple columns for the same date range? My sheet is hundreds of columns, and 5 columns are dates. I want to return rows where any of those 5 columns has a date within the desired range. Not all date columns have to fall within the range, just at least one. On top of that, it would be nice if it only returned an item once, even if multiple columns meet the date range. Many thanks Ben, I’m finding this a great help in building a company time recording system. with A1 in Sheet2? This formula works with 1/1/2018 but not with 1/1/2018, 20:00:00. Thank you. Ben, this is great stuff. I really appreciate it. What I’m trying to figure out is how to select based on the month. I want to be able to take a timestamp from a form entry, and then run the numbers from THIS month. I was thinking that I could use something like, MONTH(TEXT(TODAY(),”yyyy-mm-dd”)), which would give me this month, and then search the log for months that match. But I’m no SQL expert here, and I’m not sure how to actually DO that. Hi i was trying to filter out results if date column in worksheet1 lies within the range of date columns “from date” and “to date” in worksheet2 but getting error. it works if there is no date filter but with date filter it gives an error. hi BEN, I followed your exemples but my query with dates doesn’t work. Can you help me?? Evaluating the data range for (in this instance) current day using your “today()” function inclusion for Query. Start Date and End Date are columns C & D, I am returning columns B & F (Name and Leave Type) for the report. I am returning the correct fields but the wrong records (the evaluation is obviously occurring incorrectly). Is some of your prior examples you were performing scalar functions to manipulate the date against single cell references, can this be done against the column and if so how? I wanted to filter by a date range – specifically any date that falls within the last year. C should say 50 as A1 and A2 fall within the last year. But this didn’t work. Most of the above help is about extracting via query. I will be usinig query to get all the information i need to a second sheet and then wanted to filter by date. I’m trying to pass in the query from another cell – all works well until I start using dates – can you help? Q10 works as desired – but I want to dynamically create the query string based on other conditions and thus being able to pass in the query string is a requirement (vs. parameterizing a literal string). Thank you so much! This is exactly what I needed! The example sheet was super helpful, too! Within a select statement I need to check the cell is an actual date. Do you have an example of how to include an isDate test? That is perfect. Thank you for the posting. I am trying to use query to report counts for months My query string below does a good job but how do I get it to attach the year so it stays in chronological order instead of putting Jan at the top of my report. Can you please give me some syntax to select a value from a date range? I have a spreadsheet for my fitbit and want to be able to select the total number of steps per month, based on date. the date column is column A, range is a5:a371. The steps are column B, b5:b371. I changed the query to “=QUERY($A$5:$B$371,”select b where a > date ‘”&TEXT(A5,”2019-01-01”)&”‘ and a <= date '"&TEXT(B371,"2019-01-31")&"'",1)" but it is returning an error so obviously something is wrong. hi BEN, I followed your examples but my query with importing doesn’t work. Can you help me?? Thank you very much for your post. It’s illuminating as usual. Would it be possible for you to help me with my query problem? Q2 is the cell containing the 52-week highest price. All I’m trying to get is the date where the highest price was reached. Other readers are also welcome to answer this question. Thank you in advance. Hola Ben, como hago referencia a una celda dentro de una función escalar? and both reference at correct. 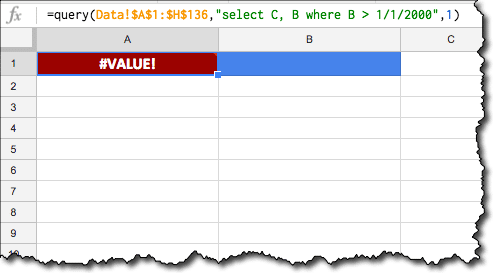 E a expense category for each individual data point which is supposed to sum in G.
I have both the data clause working separately as well as the expense category clause working separately. But they are not working together. Any help would be appreciated. The date, March 25, 2019, appears in column B and I want my formula to tell me when 2 weeks (or 10 business days) from that date is. My experience is that date comparison is best handled by treating it as a number. If the date is to be constructed from year, month and date then DATE function may be used. This operator like + and – can also be used to get dates few days early or late. Why I purpose change the date today data 4/3/3019 to MY A2 4/4/2019 9:28:53 the data in the query does not update i.e. disappear from the list? I entered the Today date (=TODAY()) on cell A1 of the new sheet where the query is running and tried to replace the ‘2019-04-10’ but it didn’t work. Also entered ‘2019-04-10’ in another cell and tried to refer it in the query. it didn’t work either. By the way, all dates are formatted as yyyy-mm-dd.